Nice job!! Is that the one you carved? If so, Awesome job with both painting and carving. That's really nice detail work. Looks good. Have you tried running it yet? Reason I ask is because of the line tie location and the size of the diving lip. 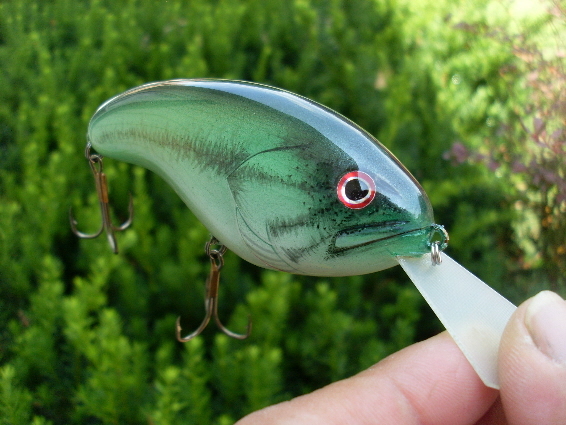 I tried one with a lip that wasn't quite as long as yours with the line tie in the nose and it didn't run so well. Kept trying to blow out. The 1st one I made didnt fare so well but this one swims like a champ and floats up nice and slow when not being retrieved. That is a truly great Lure. great paintjob as well. How did you do the stripes; pencil? No pencil just an airbrush and a fine script paintbrush.